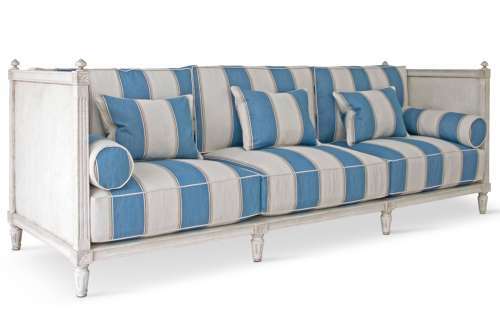 An extraordinary rendition of a grand scale 18th century Gustavian period Stockholm sofa. Hand crafted in solid birch, this sofa extends to almost 10ft in width and features decorative hand carved finials & fleuron motifs, and elegant round tapered & fluted legs. With its beautiful antique patina and fine carvings to all four sides, this sofa is equally at home in the centre of the room, as it would be placed to one side. Shown here in Antique White, it can be finished in a range of authentic Swedish hand painted colours. Approximately 18m of fabric required, to be provided by the client. Comfortably seats five adults, with six possible. A magnificent statement piece for a great room or orangery. Please note that we can bespoke make this sofa in smaller sizes.